GOTHENBURG, Sweden — Volvo Trucks executives said they are convinced that electric vehicles will play an increasingly important role in the future of commercial transportation and outlined their first steps toward making that vision a reality. 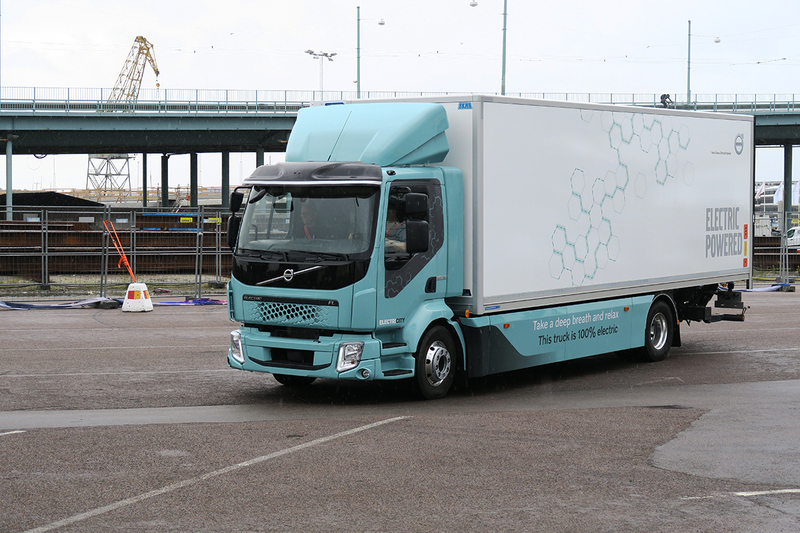 The truck manufacturer demonstrated delivery and refuse versions of its first electric powered truck, the Volvo FL Electric, and allowed members of the North American trucking press to test drive the vehicles at a company event here June 20 in conjunction with the final leg of the 2017-18 Volvo Ocean Race, a test of sailing prowess in which competitors circumnavigate the globe. Volvo first introduced the FL Electric, a Class 7 model, in April. Shortly thereafter, the truck maker went on to unveil a battery-electric version of its Class 8 FE vehicle in May. Both zero-emissions trucks are targeted for the European market, with production and sales scheduled to begin in 2019. Volvo would not say when it might bring electric trucks to North America, but the company made it clear that it has ambitions to do so. “We are evaluating the entire world. Yes, eventually we will also test in North America. We truly believe this is here to stay,” said Magnus Koeck, vice president of marketing and brand management for Volvo Trucks North America. Koeck predicted that electric trucks will replace diesel in applications such as urban distribution and refuse operations in the coming years, but it will take much longer in other segments, particularly longhaul, where the added weight of the batteries would cut into the vehicle’s payload capacity. “You don’t want to just carry ping pong balls or potato chips,” he said. Volvo’s initial focus will be on heavy local delivery and short-distance, final-mile applications where trucks return to a central terminal and can operate without the need for public charging infrastructure. “We will grow market by market and segment by segment,” said Anna Thordén, Volvo Trucks’ product manager for electromobility. After starting with urban distribution and refuse operations, the company will introduce electric trucks in construction, regional haul and in the end, also longhaul, she said. Thordén described Volvo’s new electric trucks as an opportunity to address global challenges, such as protecting air quality and reducing noise levels as the world’s population continues to shift toward urban centers. Electric trucks only generate about half the noise level of a diesel, she said. That quieter operation may pave the way for some cities to allow trucks to operate during off-peak hours, perhaps even in the middle of the night, which would improve productivity and reduce daytime traffic congestion, Thordén said. Tobias Bergman, product manager for alternative drivelines, said electric trucks already are three to five times more energy efficient than equivalent diesel models. Prior to a full launch, the first Volvo FL Electric trucks will enter regular operation with customers in Gothenburg, home to Volvo Trucks’ headquarters. The first Volvo FE Electric is a refuse truck that will begin operating in early 2019 in Hamburg, Germany. One key to the development of battery-electric trucks is the advance of lithium-ion battery technology, which Thordén said is quickly improving. Simulations and tests with current battery technology suggest that the battery may last for the life of the vehicle, she said. But another important consideration for batteries is how to recycle them when they reach the end of their useful life in an electric truck. Even when the battery’s performance declines to the point that it is no longer ideal for a commercial vehicle, it will still retain 80% of its energy storage capacity, Thordén said. She said Volvo plans to repurpose used electric-vehicle batteries to store energy captured by solar panels installed on a housing complex as part of a building project in Gothenburg. Meanwhile, electric powertrains will reduce truck maintenance compared with a traditional diesel. The electric trucks feature a simpler vehicle architecture and eliminate the need for all of the emissions aftertreatment systems required for diesel engines, said Edward Jobson, vice president of electromobility. The trucks incorporate electric driveline technology that sister company Volvo Buses has already deployed in more than 4,000 electrified buses, which are operating mainly in Europe but also in other parts of the world. Most of those buses are hybrids, but others are fully electric. The other major North American truck manufacturers also are pursuing vehicle electrification. Earlier this month, Freightliner Trucks introduced battery-electric versions of its Cascadia and M2 models, with series production targeted for 2021. Electric carmaker Tesla Inc. has said it will begin producing its Tesla Semi in 2019 during the vehicle’s unveiling late last year. And startup Nikola Motor Co. plans to build electric trucks that use fuel cell technology as range extenders. Volvo said its battery-electric FL and FE models will be available in a wide range of configurations for the European market. The Class 7 Volvo FL Electric will feature an electric motor with a 248 maximum horsepower rating, while the Class 8 FE Electric will be equipped with two electric motors providing up to 496 horsepower. Both trucks are equipped with a 2-speed transmission developed by Volvo. Customers will be able to select the desired amount of battery capacity to balance vehicle range and weight and tailor the vehicle to the given application. The FL will be available with two to six batteries, while the FE will be available with four to six batteries. Each lithium-ion battery provides 50 kilowatt hours of energy and weighs 1,146 pounds. With the full complement of six batteries, the FL Electric will offer a maximum range of up to 186 miles in ideal conditions, while the FE will offer a range of up to 125 miles. Both vehicles can either recharge slowly overnight or plug into a high-speed charger, which will be able to fully recharge the maximum six batteries in about 1.5 hours. Volvo did not state prices for the vehicles.